Wangernumb is 3 modules in one...or 4. If you use the Track input, the phase lock loop acts as a frequency tracker. 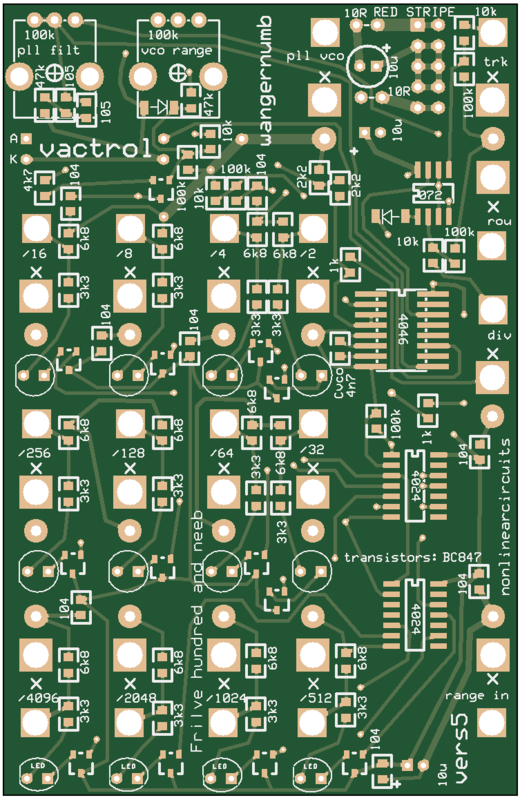 The VCO Range Cv input and filter pot will determine how well, or more accurately, how poorly it will track. You also get 12 divisions of the tracking signal, right down to divide by 4096. 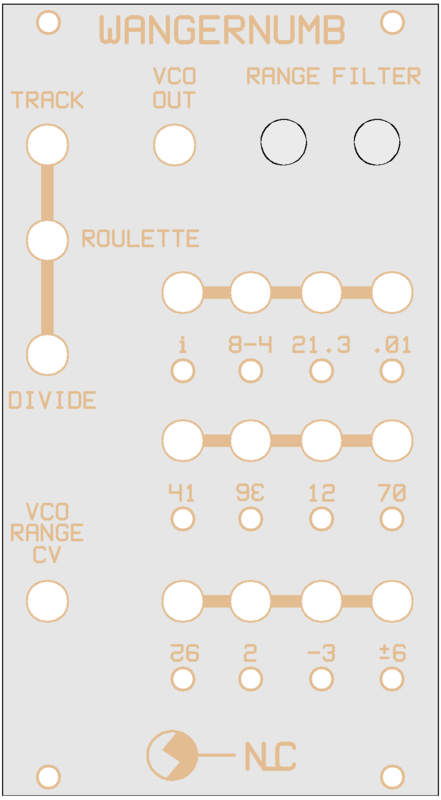 If you use the Roulette input, it will generate semi-random selections of outputs when the input signal is high....or it is a burst generator and you can control the frequency of the bursts with the VCO CV input. 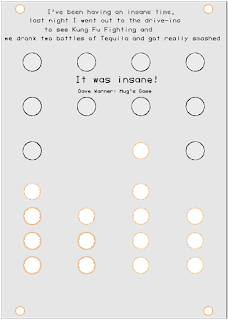 If you use the Divide input, you have a 12 stage clock divider, down to 1/4096. 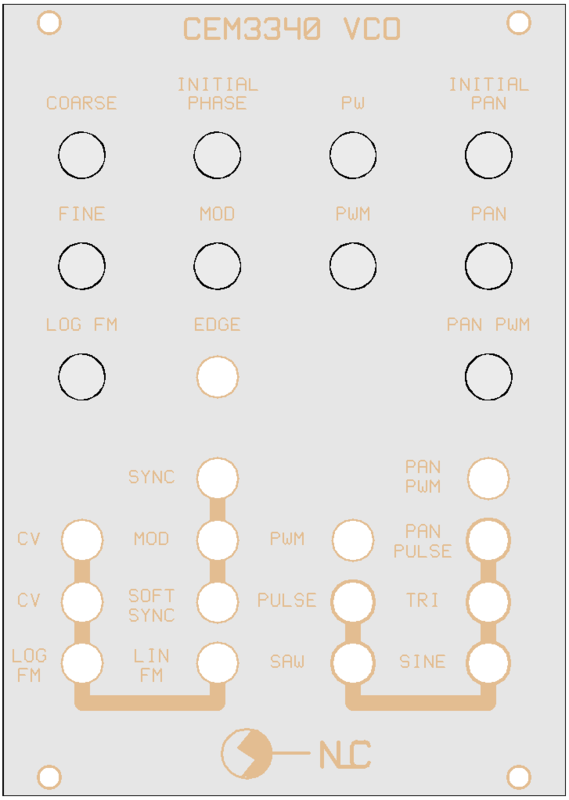 In this case you can use the PLL tracker section as a separate and independent module and just get it to generate squelchy, burpy noises. 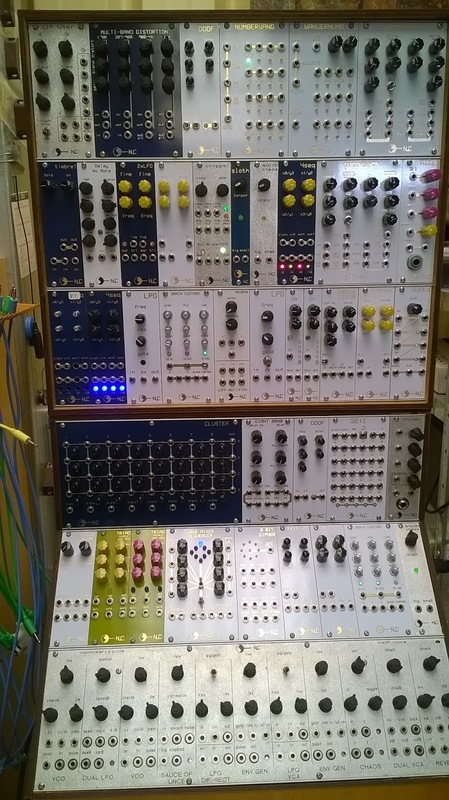 The Router was developed to use in the cellF neural synthesizer at MoNA’s Mofo exhibition in Jan 2017. 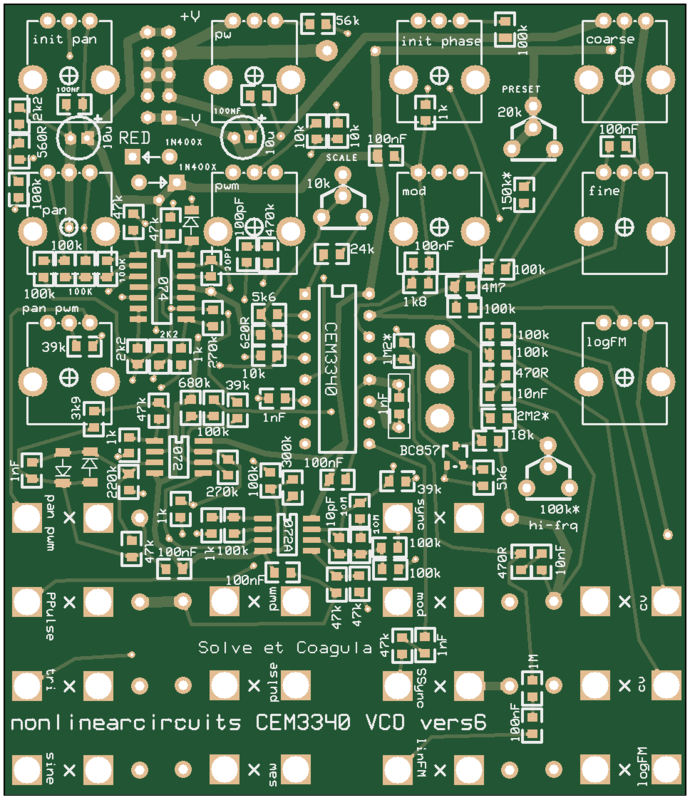 As cellF would be left running for 6-8 hours per day, we wanted a module to periodically switch around the CV signals to create new patches. The Router pots can be used as switches, 0 is off and 10 is on. At these settings the switches will ignore incoming CV or gate signals. For the switching to be controlled by CV or gates, set the pots to an appropriate turn-on point. Input 1 is internally connected to the switches on jacks 2, 3 & 4. CV 1&2 is internally connected to the switch on the CV 3&4 jack. The signals to the OUT ALL jack are summed together, as more than one signal can be on at a time; this is the safest way to merge them. 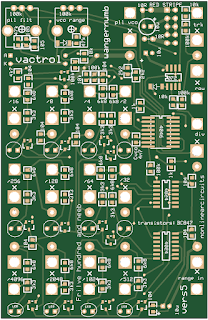 This has taken a while to get to a point that I am happy with, vers5 PCB even. Track input gives you a very badly behaved frequency tracker, along with 12 divisions of the tracker's output frequency. It performs particularly poorly when you start CV-ing the Range input, which puts a vactrol in charge of the PLLs frequency range. 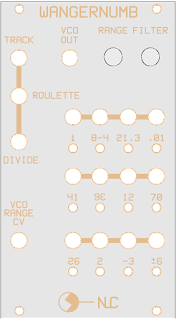 Roulette input wants a CV or gate and makes the module behave like an electronic roulette wheel. When the CV or gate is high the outputs spin and halt when the input signal returns to zero, giving a random combination of gates, plus a series of bursts whilst it is spinning. The rate of spin can be controlled by the range pot and the range CV input. Divide disconnects the PLL from the 12 stage outputs and simply acts as a 12 stage frequency divider, going down to 1/4096. 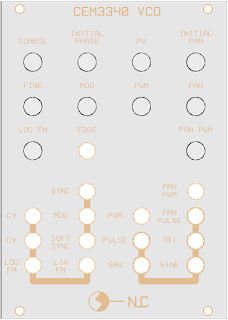 The PLL can be used as a separate module when the divider is used, so you get a raucous PLL VCO that is barely controlled by CV. The strobe input makes it a bit like an 8 bit sample and hold. If nothing is inserted into the strobe jack the module carries on as normal. When a signal is introduced to strobe, the data obtained from the data jack is only loaded onto the outputs when the signal is high. 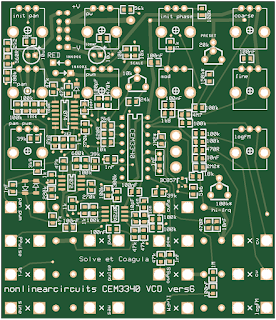 Like virtually everything else in the NLC synth, any signal crossing 1V can be used as a clock or data signal. The best way to see what it does is feed it two signals from different sources, say two LFOs. Leave the clock signal steady and vary the frequency of the signal to the data input. Also try different wave-shapes such as square, sawtooth or triangle. You will see how the data is shifted down thru the stages. It takes a little bit of tweaking to get the data moving thru in patterns you like, but should be very easy to see what is happening by watching the LEDs. 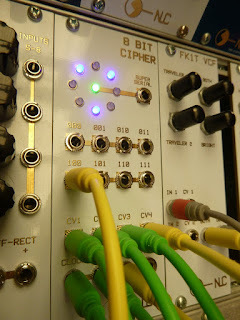 Once you have it running nicely, connect one of the CV outputs to a VCO and have a listen to the patterns. Tweak the signal on the data input to see how this changes. The first & final stages are fed back to Data input2 via a crude XOR circuit. 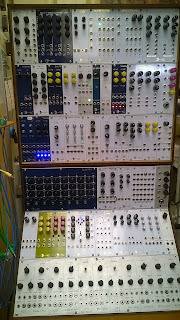 If nothing is patched into this input, the feedback signal will ensure a nice level of complexity to the output patterns. The CV outputs are all related to each other but are all different; part of CV1 is fed to CV2, part of CV2 is fed to CV3 etc. 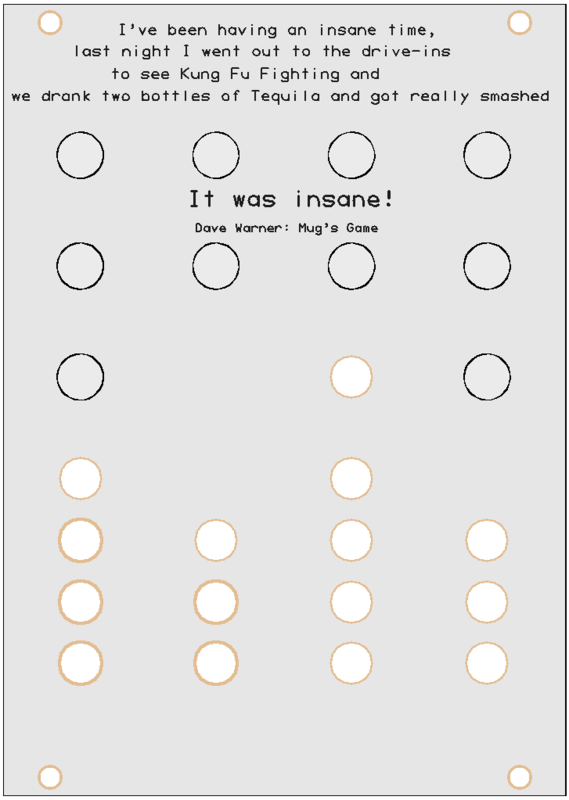 The stage outputs are great for driving drum modules….or anything you like. 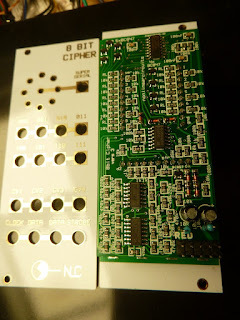 Place the connectors on the bottom PCB, solder the 2 end pins 1st and check they are standing perpendicular to the PCB. Correct if necessary and then solder the rest. Remove the upper PCB and install the sockets & LEDs. It might be nice to install a different coloured LED for the centre (serial) position. 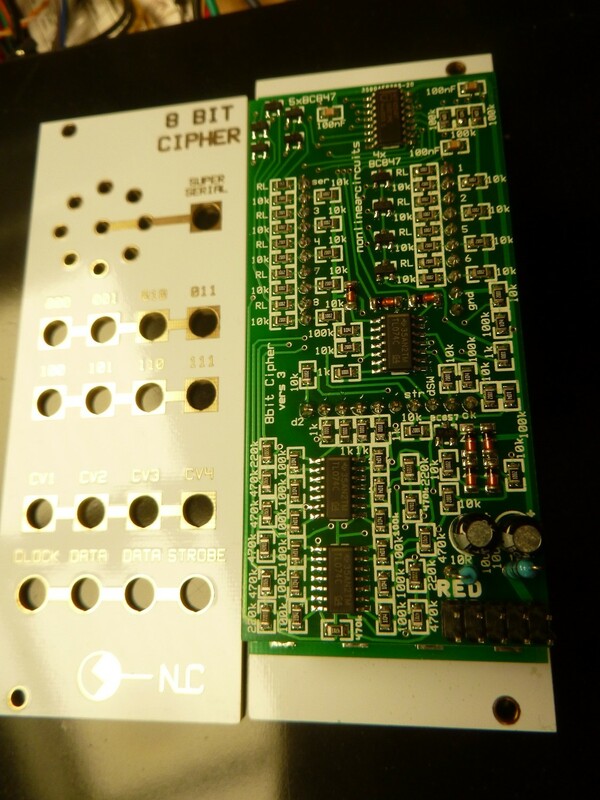 I found it easiest to place the sockets on the PCB (unsoldered) then place the panel over them. It takes a little bit of jiggling, then hold the two together with one hand and screw the nuts on. Finally solder it all up.